Just another itty bitty av trying on clothes in Second Life. Hello! I am one of the Spirit Hunters of the Forest. It is quite rare that a mortal human can see us. As you can see we hide our appearance behind these masks. We live dual lives since we are immortal. We walk amongst you during the daytime and you will never notice us. Unless you are an individual who can feel our spirit energy. Which is the only reason you can see me now in my mask. You are one of the few gifted humans who has this ability. But with this gift comes a great price. This spirit hammer is one of my most powerful weapons. I have no idea why I am divulging all this information to you but for some reason I feel like I can trust you. Perhaps you are the human that the oracle had foreseen in my future. This is my spirit bow, it is enchanted to always find my targets no matter where they are hiding. It took a few centuries to master that technique but I am one of the few who has. I carry both of these weapons to protect the humans from creatures that you can not see with your naked eye. You can feel them as the little hairs on your arms start to rise for some unknown reason. These creatures feed on your fears. It has been our mission to ensure that humanity does not become victims to these spirits and hence we became the immortal hunters. You humans have no idea what you take for granted everyday. The ability to reproduce, the ability to love others and be loved. These are not things that we are allowed to have since we spend all our time either protecting or in training mode. We alternate sleep patterns. Every 20 years four of us go into a sleep chamber to sleep, and when we come out we go thru a intense training session. So if you want to be part of this crazy world then stay, but if you are scared of the things I can do to you in a split second. Then I suggest you leave right now before the others arrive. Hidden deeply in the mountains there is a safe haven for all alchemists to gather at, it is considered sacred grounds and no one is to use their powers against one another. Until today, no one has seen this safe haven. Tucked away in a beautiful area surrounded by luscious trees and flowers there are the sacred ruins. At these ruins the alchemists perform rituals. As you can see, near the ruins lives a sacred lake snake that lives in this magnificent colorful pool of water that was created just for the creature. 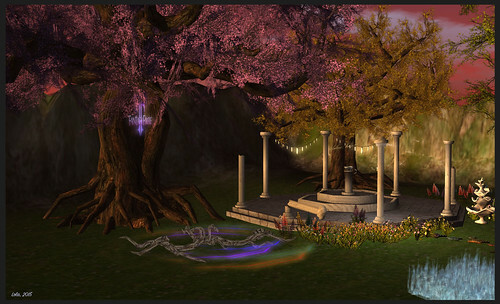 The beautiful trees with their illuminating foilage are available at Fantasy Faire. 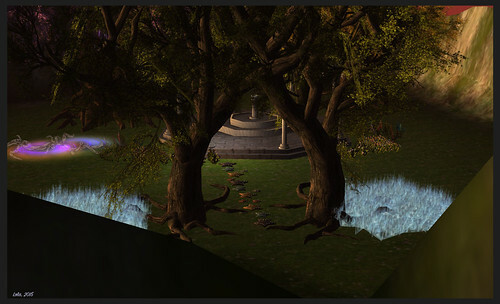 The purple tree is called the “MoD – Sylvan of Spells – Fairelands Hollowtree”. The tree is modifiable so you can shrink it to a size that is more suitable to your parcel. The golden tree is called “~*SR*~ Elemental Tree – Earth Box” and the interesting portion about this tree is that it has such a lovely phrase that circles around the tree. The phrase is empowering for those who are fighting cancer. As you can see we have two Alchemists together at the ruins. They have been startled by the presence of a human. Humans are forbidden to enter this safe-haven so they are in a protective mode. The female alchemist is a orc that is also a alchemist. This is quite rare in the Orc world and it is a highly respected position to hold. 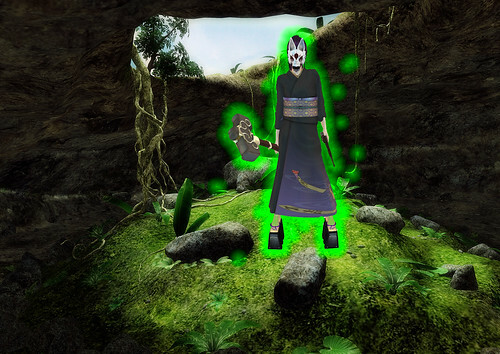 The male alchemist is a elf who dwells in the woods deep in the dark forest. He is one of many in his family who has attained the gift of alchemy. Both alchemists are wearing the “[Gauze] The Alchemist” outfits. As you can see the female version is a little more provocative but she still has that edge. Whereas the male version looks strong and fierce in his outfit. As you can see, this elf takes great pride in his appearance. He is wearing the RFL “Jack” hair by /Wasabi Pills/ and elf ears by Eclectica. I do like the design of the Eclectica ears but I found tinting the ears to be a tedious task. But I do love the Hide/Show option of their jewelry. I hid the jewelry on the ears and wore the Dragon Magick Wares “Dragon Ear Cuffs” and I also wore the Dragon Magic Wares “Mystical Necklace”. I was quite fond of the necklace. I felt it was the perfect necklace to use as a totem of some sort for a alchemist. Fantasy Faire has been officially open for four days now and I hope that many of you who are interested in Fantasy apparel drop by to see all the new and wonderful designs. Also, there are items that are available in special colors that are being sold to donate their profits to RFL. Relay for Life is one of the oldest charities that has taken place in Second Life and you often see it associated with Fantasy Faire. This year I am relaying for a few reasons, my grandmother who is still battling her breast cancer, for my grandfather who lost his life to prostate cancer, and for me. I never really talk about it but the reality is that if for some reason my medications stop working on my tumor I will develop brain cancer. This is something that I live in fear of everyday. So this year I decided to participate as a blogger in Fantasy Faire. I am lucky enough to know a few creators who create wonderful fantasy items and I love supporting them. So of course you will see posts about them here and there but I am also blogging new to me stores. Up first is a new to me store, Fujiwara’s World. I was quite intrigued when I received the box and it said “Kemono mods”. I knew I finally had to give in and get the cute avatar. As soon as I applied the Fox Mod that was created by Saixina Aura I immediately fell in love. There are several versions available for purchase. I am only showcasing one color to avoid inundating you with a ton of pics. This is the “Neon Cyan” mod. There are 3 types available: the Neon Versions, the Trifox Versions, and Un-Tiger Versions. Each version comes in a assortment of colors. I am also wearing the RFL version of the “Jasmine” hair by Wasabi Pills in the color “Sorbet”. This hair was meant for this avatar I love how adorable it looks on the Kemono Avatar. I am also wearing the new eyes by ni.ju for Kemono Av’s called “[NI.JU] M3/KEMONO Bubble Eyes // Pack 1” (if you haven’t noticed already I have a affinity for the color purple). So in the picture below here is my attempt at a Role-Play type of picture. Basically my avatar has been seen by Humans. Le Gasp! And she is contemplating her next move. Does she use her claws and mangle them or does she use her strong legs and outrun them in hopes they don’t have any weapons to capture her. Tskk tssk tskk never get caught in dark alleys you never know what you will find. Today I will be showcasing items by [GAUZE], that I have been wearing all week but just haven't had the time to sit here and write out this lovely blogpost. Yukio Ida is probably one of the hardest working creators I know who is willing to try new techniques and collaborate with other great creators to make the perfect items that fit her vision. This time around she has collaborated with the owner of BluPRINTZ once again to make the lovely "Celestine Gown". The unique details with the gown are something I know that would come from the inner depths of Yukio's artistic mind. The gown is absolutely breathtaking and very ornate in its design. I love the crystal like adornments near the top of the gown that added to the celestial appeal of the dress. 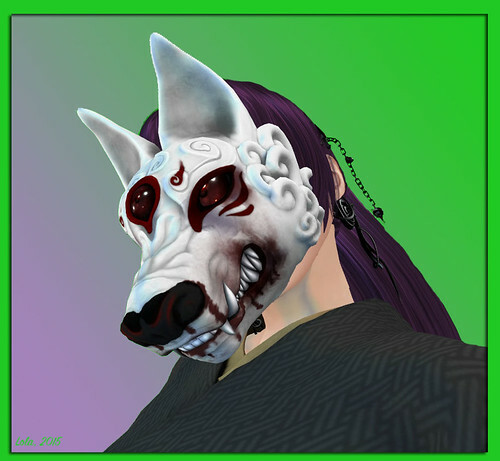 Also, I am wearing the newly updated “Chronicle Skins by [GAUZE]” that now have Omega Appliers, Slink Appliers for the skins. The skins have also been updated with little intricate details and a softness added to the body that was not as prominent on the first line. I decided that I would prance about as some type of Elf-Demon Goddess who only comes out and communicates with the animals at night. As you can see, the back of the dress has quite an astounding amount of detail drawn in by hand. What I also forgot to mention earlier about the dress is that it also comes with appliers so that you can apply the tattoos on your mesh bodies also. The ornate tattoos hide the special spots of your body so that you don’t need to wear a layer of clothing underneath that deters from the beauty of the outfit. Since every celestial creature has a place they call home, I decided that mine would be near the lake. Every once in a while you stumble across a pose store that you have noticed before but never had the lindens to buy any of the poses. Luckily this year I came ready with a ton of lindens in my pocket to Pose Fair. I grabbed 3 great pose sets from Black Tulip and I would love to show you each of them. This time around I only selected a minimum of 2-3 poses for each set. Each pose pack comes with a set of 6 poses including mirror copies of each pose. In the image above, I am using the poses from the Beauty #4 Pose Set. I really loved how each pose was unique and showcased the lovely curves of the avatar. What I love even more was that it accommodated avatars with more curvy features. A lot of times I find my hands inside my head or my hips and in this pose pack I did not have that problem. Every once in a while a pose set like “Solitude” comes in handy when you are trying to portray emotions with your pictures. There were several great poses in this set. I chose only 2 to showcase because I loved these 2 the most. These lovely “Standing by the window” pose set are amazing. They have some rather unique poses I have not seen in other stores. I loved that many of the poses gave you that look as if you are looking out into oblivion. The great thing about exploring Pose Fair is that you can always find pose stores that you have never heard of before. I tend to stay on my platform a lot and well most of my time previously was spent building but I have taken a break from that at the moment. I happened to come across this store called “Aerial Poses” and they had a few cute pose sets but what really caught my eye was the pose set they made specifically for Steampunk pictures. In the set you get 10 creative poses that work well with the typical victorian-esque styled dresses that most wear when role-playing in Steampunk. Since there are so many different fashionable ways to dress an avatar the poses in this set would work well with any outfit. I loved the foot positioning and the movement between poses was rather beautiful. You can find this vendor and some of your favorite Pose Makers at Pose Fair. TP HERE to check out Pose Fair 2015. This is my second post for Pose Fair and I am a little excited that I was able to get these items during the Blogger Preview. Due to my illness I was only able to go on Friday from 10:00 p.m. to midnight but I luckily ran into my friend Vanity and she gifted me these poses to blog. This is one of the vendors I love that is at Pose Fair and there are many more to see. Some of your favorite Pose Makers are participating also. TP HERE to check out Pose Fair 2015. SLINK Nails, Gloves, Stockings, etc..